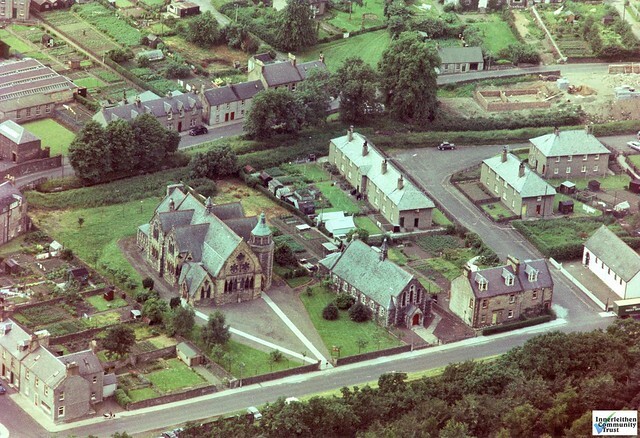 Over the centuries there have been at least ten buildings consecrated for religious worship in Innerleithen. Three of these continue to fulfil their original purpose: the Church of Scotland and St. Andrew’s Episcopalian Church in Leithen Road, and St. James’ Roman Catholic Church in the High Street. Two former churches in Princes Street and Buccleuch Street were neatly converted into residential flats and one in Peebles Road became a shop. One in Chapel Street is now the Masons’ Lodge and social club. Two were completely demolished, the stone and slates being salvaged for house building. Of a medieval church (or churches) once located on the hillside above the Kirklands there remains no trace.